DESCRIPTION: The Ruddy Duck is a small diving duck with a sharp tail made of stiff feathers, which are erect when the duck is at rest. The drake is mainly rufous brown with a black crown and nape, white cheeks and a light blue bill. The tail is dark grey. Females are mottled brown, as well as non-breeding males. Females have washed out white cheeks with a stripe across it. The legs in both sexes are grey. This duck is around 40 cm (15 inches) long. NAME: The English name ‘Duck’ is from Anglo-saxon ‘duce’ and means ‘diver’. The English name ‘Ruddy’ refers to the drake color. The Latin name ‘Oxyura’ refers to the pointed tail of the duck, and ‘Jamaicensis’ to the location (Jamaica) of the first identified individual. HABITAT: Wetlands such as marshes, small lakes and ponds. DIET: Plant material such as roots and seeds, also crustaceans and insects. NESTING: The nest is hidden in thick emergent vegetation. An average of eight unusually large white eggs are laid, which are incubated by the female. Ducklings can feed themselves soon after birth. DISTRIBUTION: This duck is a North American species. In Canada, its breeding range covers mainly the Prairie Pothole Region, but in the USA and Mexico it covers most of those countries. For the winter this duck will migrate to coastal areas and wetlands that do not freeze. Some individuals have also been able to reach Hawaii. 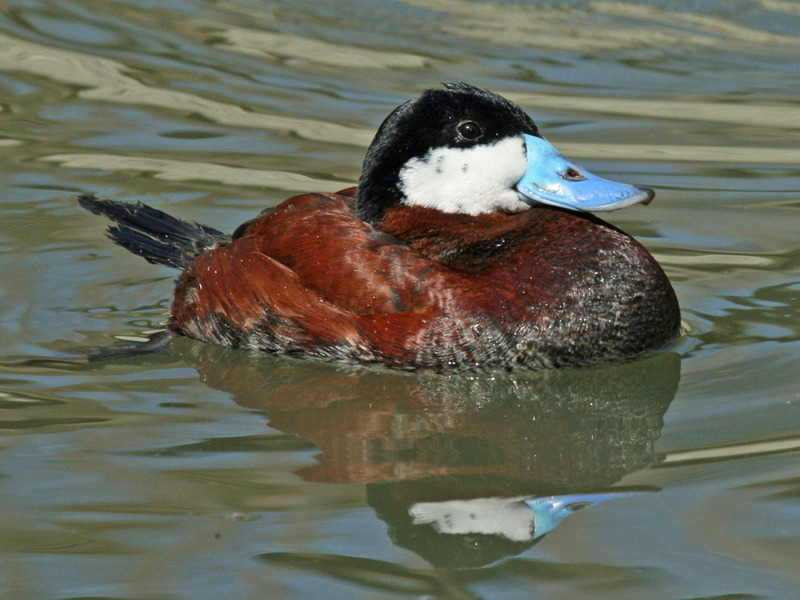 ON PEI: Although the ruddy duck breeds on Prince Edward Island and is a year-round resident, it is rarely observed. CONSERVATION: The population of this duck species appears stable and is not currently at risk. It is not very popular with hunters, which helps. However as with other waterfowl it is vulnerable to habitat loss and degradation from pollution and development. NOTES: This duck is not very good at walking on land. Grebes may attack it from under the water. Invasiveness controversy: the ruddy duck was imported in the UK in 1948 and then spread in the wild, and into other European countries. Because it interbreeds with the endangered White-headed Duck (belonging to the same genus), conservationists in Spain were alarmed at this and requested a cull of the ducks migrating from the UK. So the British started culling their ‘alien’ population, at a cost of some 915£ per duck ($1,665.00 CDN), which makes it the most expensive duck in the world, as per bird lovers in the UK. Then some of those birders aptly commented that there was little point in culling the UK population if the same action was not undertaken in ALL the other European countries where the duck is now established. And there appears to be little incentive to do so due to the high cost and logistical difficulties in locating those birds, and the challenge of NOT killing by mistake the female white-headed duck, which looks very similar to the female of the ruddy duck.